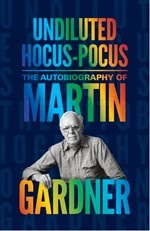 It took me two-and-a-half days to read Martin Gardner's autobiography and jot down enough notes to write a lengthy review of it. 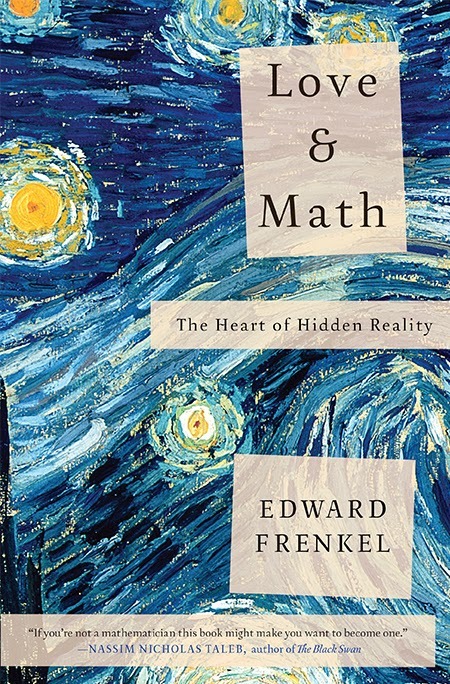 I purchased Edward Frenkel's new, rich volume, "Love and Math: The Heart of Hidden Reality," a few days later and took over three weeks to finish it. I won't do a detailed review simply because there's so much of it I don't grasp well enough! That might sound like a negative…but in this case it ISN'T; in fact, it's a glowing positive… I love the book, from its Vincent van Gogh cover to its endnotes and "glossary of terms" (even though there is much in-between I don't yet comprehend)! Let me explain: I once commented to a friend that most people seem to enjoy attending talks/lectures where they understand (or agree with) everything that is being said… I find those b-b-boring! Rather, I enjoy going to talks/lectures that are way over my head (or offer viewpoints I'd never considered), and being challenged to pull out of the air whatever bits of new learning I can draw from them… a talk that is 80% incomprehensible to me, but that I learn new ideas from, and stretch my mind from the other 10-20%, is a great, almost exhilarating, talk to me. THAT'S the sort of feeling I get reading Frenkel's new volume. I've seen references on math and physics blogs for awhile now to the "Langlands Program," but without getting much sense of what it is. Frenkel's book covers a lot of ground, but with a primary purpose of elucidating to a general audience the Langlands Program (his specialty), and why it is so important. The book is an odd mix of personal history and introduction to real and advanced mathematical ideas. The early chapters are interesting and important foundationally, but the volume really takes off on its mathematical excursion with chapter 9 on Andre' Weil's "Rosetta Stone" of the connection between number theory and geometry through the three "parallel tracks" of "number theory," "curves over finite fields," and "Riemann surfaces." From there on, lots of discussion of manifolds, sheaves, Kac-Moody algebra, Lie groups, gauge theory, SO(3) groups.... latter chapters becoming increasingly difficult if you haven't fully fathomed earlier chapters…. heavy-duty stuff for the average person who finds this book lying next to Tom Clancy or Barbara Kingsolver on a table at their local bookstore!! "As we established in the previous chapter (see the diagram on p. 161), in the version of the Langlands relation that plays out in this column, the cast of characters has 'automorphic sheaves' in the role of automorphic functions (or automorphic representations) associated to a Lie group G. It turns out that these automorphic sheaves 'live' in a certain space attached to a Riemann surface X and the group G, called the moduli space of G-bundles on X. It's not important to us at the moment what it is." Got that!? Me neither, but I have fun trying. Frenkel ardently tries to walk the reader through many ideas and how they tie together, and to do so at a level that a lay person can follow. His own fervent passion for his subject exudes off almost every page. "The Langlands Program has been the focus of this book. I think it provides a good panoramic view of modern mathematics: its deep conceptual structure, groundbreaking insights, tantalizing conjectures, profound theorems, and unexpected connections between different fields. It also illustrates the intricate links between math and physics and the mutually enriching dialogue between these two subjects. Thus, the Langlands Program exemplifies the four qualities of mathematical theories that we discussed in Chapter 2: universality, objectivity, endurance, and relevance to the physical world." Last year I commented that one of the many things I liked about Paul Lockhart's book Measurement was that the author made no pretense that math is easy… he warned readers at the start to be prepared to really slow down and think while proceeding through the book… that parts would be tough-going. Too many popular math books hype themselves as volumes that will finally make you enjoy or connect with math… when it just ain't so. I still believe that Steven Strogatz's book, "The Joy of X" is one of the ONLY books that actually achieves such a goal of wide accessibility to non-mathy readers. "This is really a sad day. Not so much sad that Martin died, since we all knew it had to come pretty soon, but sad because his spirit was so important to so many of us, and because he had such a profound influence on so many of us. He is totally unreproducible -- he was sui generis -- and what's so strange is that so few people today are really aware of what a giant he was in so many fields -- to name some of them, the propagation of truly deep and beautiful mathematical ideas (not just "mathematical games", far from it! ), the intense battling of pseudoscience and related ideas, the invention of superb magic tricks, the love for beautiful poetry, the fascination with profound philosophical ideas (Newcomb's paradox, free will, etc. etc. ), the elusive border between nonsense and sense, the idea of intellectual hoaxes done in order to make serious points (for example, one time, at my instigation, he wrote a scathing review of his own book "The Whys of a Philosophical Scrivener" in "The New York Review of Books", and the idea was to talk about the ideas seriously even though he was attacking the ideas that he himself believed in), and on and on and on and on. Martin Gardner was so profoundly influential on so many top-notch thinkers in so many disciplines -- just a remarkable human being -- and at the same time he was so unbelievably modest and unassuming. Totally. So it is a very sad day to think that such a person is gone, and that so many of us owe him so much, and that so few people -- even extremely intelligent, well-informed people -- realize who he was or have even ever heard of him. Very strange. But I guess that when you are a total non-self-trumpeter like Martin, that's what you want and that's what you get." That Martin Gardner was a "fideist" and a "mysterian," that his literary tastes were far-flung (including G.K. Chesterton, H.G. Wells, Frank Baum, Lord Dunsany, Miguel de Unamuno, Lewis Carroll), that he had little formal mathematical training yet inspired a slew of others to pursue such a course, that he was opinionated and outspoken while also being shy, humble, and unassuming, and that he was one of the finest thought-provoking writers I've ever encountered... made him, for me, one of the most remarkable individuals in all of Americana. I only wish his autobiography was twice as long, for I never tire of reading him and feeling enriched. This book is both simple and complex, befitting the simple and complex person it is about. I can just imagine Gardner begrudgingly laboring on this volume at the behest of others, and wondering why anyone would find his vanilla life interesting. The writing is terse, succinct, matter-of-fact, conversational, even rambly at times, neither flowery nor scintillating, yet still fluent and interesting; sprinkled throughout with Gardner's subtle humor, illustrative anecdotes and encounters with other interesting people. These words and stories coming from some ordinary individual might not even be worth relating, but coming from Gardner they rise to another level. "The best known remark of stand-up comedian Lenny Bruce was that people are leaving their churches and going back to God. What follows here is a rambling autobiography of one such person -- me." "The Night Is Large" is a superb anthology of many of his best and most varied essays stretching from 1938 to 1995. Whenever I meet people who know of Gardner only as a recreational mathematician, this is the first book I recommend that they additionally read. "The Whys of a Philosophical Scrivener" is Gardner's 1983 treatise on his many underlying philosophical notions; never one of his most popular or well-known books, it is must-reading if you wish to understand the man behind the math and the skepticism. It is a book that surprised many when, despite that outspoken skepticism, he came out as a theist or what he characterized as a "fideist" -- believing in an indefinable God despite having no rational reason or argument for doing so (but simply out of emotional comfort). I was emerging from my own longstanding agnostic/atheist phase when I read this volume and discovered that "fideism" was about as close to any term I could find for my own newly-evolving belief (and apparently I had some good company). Gardner's near-infatuation with Spanish philosopher Miguel de Unamuno was another surprise from "The Whys..." book. Prankishly, and no doubt realizing how many of his acquaintances would be shocked by the contents of the volume, Gardner wrote a scathing tour de force critique of the book, under an alias ("George Groth"), for the NY Times (only at the very end of the biting piece is the shenanigan divulged) -- one of his all-time best stunts (and there were many), apparently at the behest of Doug Hofstadter. If you're interested in Gardner and haven't read these two volumes, they go on your to-do list. "Now that I am an old man, my heart still leaps up when I, too, see a rainbow. It made a high leap one morning when I saw a secondary bow. The wonderful thing about a rainbow is that it is not something 'out there' in the sky. It exists only on the retinas of eyes or on photographic film. Your image in a mirror is similar. It's not a thing behind the looking glass." One particular story in these chapters helped explain an oddity to me: One of the most unusual finds I ever made in a thrift store book section was a 470-page volume Gardner authored on the Urantia Group, "Urantia: The Great Cult Mystery" -- one of the oddest cults of all time; one based upon the bizarre 2000+ page "The Urantia Book." Why Gardner bothered to plow through 2000 pages of craziness and devote time writing an entire book to debunking the cult (and by his own admission he knew there would be limited audience for such a tome) I could never fathom; but in chapter 7 he explains (almost embarrassingly) that the Seventh-day Adventist origins of the cult is what drew his attention because he'd once been attracted to the religion himself, even though he admits the book project was probably a waste-of-time. For all my admiration of Gardner I sometimes found the severity of his skepticism objectionable. Several topics that he viewed as nonsense or rubbish I'd be less completely dismissive of (always leaving a crack open for more future information). My biggest disappointment with Martin was his complete rejection of "General Semantics." In chapter 8 he briefly discusses the subject (which he's covered more extensively elsewhere). His blunt criticism of its founder, Alfred Korzybski, may be partially on target, but I believe his negativity toward the more general movement was greatly off-base. Where I attended high school a "course" in general semantics, based on S.I. Hayakawa's popularization of it, "Language In Thought and Action," was a one-semester requirement (embedded into an English course) -- to this day I consider it the single MOST IMPORTANT course I took in my entire academic life! ; it perturbs me that Gardner (and so many others for that matter) failed to see the societal significance of it. So while Gardner sang the praises of many literary figures for reasons I could barely fathom, he dissed one of the most important schools of thought I'd ever encountered (although he wasn't particularly critical of Hayakawa as one of its proponents)! Moreover, General Semantics passes along some of the critical thinking skills that makes one less susceptible to the very sort of 'pseudoscience' Gardner spent his life combating (but admittedly, Gardner, not I, was in the majority, as GS's strongest proponents over the years have been few-and-far-between). Chapter 10 covers Gardner's turn to journalism and writing (having decided he didn't want to teach philosophy) and taking his first job in Tulsa, Oklahoma. Chapter 11 veers off to tell us about his parents (mostly his dad) and mention of brother Jim and sister Judith is also made. Chapters 12 and 13 cover Gardner's time (4 years) in the U.S. Navy, which, to my surprise, he seemed to enjoy quite satisfactorily, and where he learned the nature of, and some control over, migraine headaches that had plagued him. He also tells amusingly about learning to 'toss in four-letter words' in conversation while in the Navy. From the Navy, Gardner returned to Chicago where he wrote fiction for Esquire and then, believe-it-or-not, wrote for the children's magazine "Humpty Dumpty." He mentions that the last sentence of one rejected Esquire story, about a man who commits suicide, ran something like this: "The cut was a perfect geodesic, the shortest and simplest curve joining two points on his neck" -- ah hahh, hints of the Scientific American columnist yet to come!! The big break to SA came in 1956 when they published his first famous piece on "flexagons." ...And the rest, as they say, is history! Gardner explains, touchingly, that his own mathematical ignorance helped him, as he had "to struggle to understand what I wrote, and this helped me write in ways that others could understand." Chapter 15, recounting so many of the highlights of his time with Scientific American is a wonderful read, and a great walk down memory lane for all who followed Gardner during those years. (By the way, I noticed that an early Rouse Ball puzzle book that Gardner references as one of his own early math recreation inspirations is freely available on the Web here: http://www.gutenberg.org/files/26839/26839-pdf.pdf ). Chapter 16 delves into Gardner's "skepticism" and his unrelenting censure of "pseudoscience." He was an early member of what today goes under the name "Committee For Skeptical Inquiry," a major "skeptics" group that he played a leading, vocal role in. I joined that group early as a dues-paying member, but dropped out some years later when it seemed clear to me that the Committee was not so much interested in "skepticism" as in "debunking" -- there's a difference -- true skeptics will still investigate a phenomena with open-minded objectivity in search of the truth, whereas debunkers go in with their minds pretty much already made-up and a specific purpose to debunk (one of the founding members quit the group around the same time and for the same reason I let my membership lapse -- I should add that I still have admiration overall for the work the Committee does). Moreover, the group aimed most of its fire at fringe or pseudo science where the pickings were easy, instead of academic science where it takes more bravery (and work) to call out critical shots. True skeptics have to also be skeptical of science, of evidence, of data, of human endeavors, and even skeptical of skeptics! A lot of very weak/poor science creeps into so-called 'evidence-based science' and the line between the latter and 'pseudoscience' is simply blurrier than most pretend. In short, I often see 49 shades of gray ;-) where Gardner and others regularly painted things in black-and-white. It was, by the way, the sharpness and strict rationalism of Gardner's skeptical stances that caused many to be stunned by his religious disclosures in the "Whys … Scrivener" volume. Colm Mulcahy noted in a podcast interview that the headshot photos used for Gardner books always displayed a serious, dour-looking, even sour, face (and the same is true of the photos in this volume), even though in-person Gardner was warm, friendly, and puckishly humorous -- I've always presumed that Martin picked out those pics himself, and it says something about how he saw himself (but just my guess). That Gardner lacked formal education in mathematics (taking no math courses beyond high school) has always been an inspiration to me, as a math blogger lacking the pertinent academic background for my own online endeavor. There are of course other math and science popularizers who cover their subject despite a lack of specific academic credentials, but Gardner was in a league of his own. My only two disappointments with this volume are that 1) Gardner doesn't discuss math Platonism to any significant extent; a subject I love to hear him expound on; and 2) the book is too short! I could've easily read another 100 stories/anecdotes/memories from his past. This particular volume, variously described by Gardner himself as "slovenly," "rambling," and "disheveled," probably won't win any national book awards for writing, but to his many fans it is most assuredly a prize!